​Under the counter ice makers are among the most popular choice of ice makers for families. The reason is quite obvious. They come with numerous advantages, with only minor compromises. They are compact, and can be installed in a small space under the kitchen counter. Besides, they are designed to blend perfectly with any type of the kitchen décor, and produce enough ice for even a large family. Naturally, they have become a big hit. Let our professionals at Comfort Heating & Cooling Solutions, LLC take care of all your ice maker needs. As much popular as they are, unlike a refrigerator, it is not a simple task to install an under the counter ice maker. The task is best left to professionals like us, to ensure that everything works perfectly at the end of the day. For instance, most under the counter ice makers require a water drain, which is usually absent in places where these ice makers will be installed. The solution involves installing a drain pump for the explicit purpose of draining the water away. Not to mention, the water supply required for the ice maker. That water should also be at an optimum temperature, and pressure when it reaches the ice maker. There are a number of safety precautions to be taken during the installation too. The under the counter ice maker should not be near any heat sources such as a grill, oven, or a gas stove. The ice makers should also be installed perfectly level with the ground. Also, there should be adequate clearance on all sides of the unit for easy service access and installation. We install under the counter ice makers across Florida in multiple cities including Marianna, Sneads, Graceville, Cottondale, Grand Ridge, Greenwood, Alford, Malone, Two Egg, Campbellton, Bascom, and Jacob City. Because of our large scale operations, we deal with manufacturers in bulk, and are able to command great prices on the equipment. We transfer these cost savings directly to our customers, which means that you, our esteemed customer, get the most inexpensive and high performing under the counter ice machine on the market. Isn’t that great! If that is not enough, we even offer the periodic limited discounts on various products. The idea is to promote the most energy-efficient, environmentally friendly, and money-saving products in the market. Once we have installed our product, you will notice the visible difference in performance too. 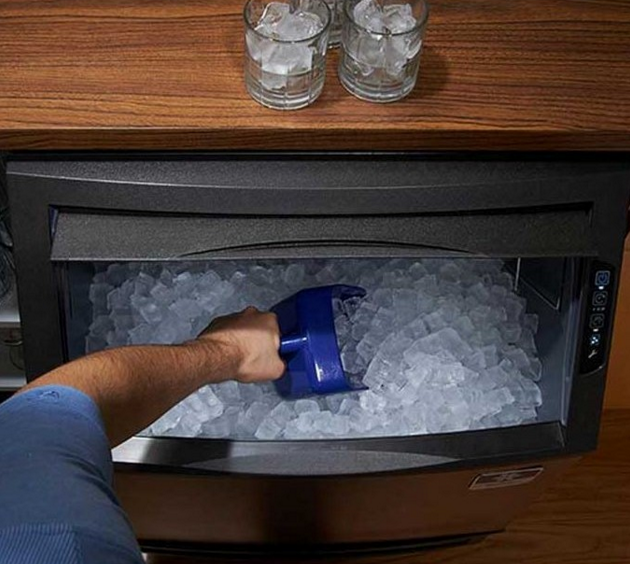 Compared to other available products, your under-counter ice machine will be regularly saving you up to 30% on utility bills. When you experience even the slightest issue with your under the counter ice maker, don’t think twice before giving us a call. To make things easier for you, we do not charge for consultation and inspection. Only if you decide to go ahead with the installation, or repairs, will you be charged. Therefore, feel free to give us a call any time that you need us. What might appear as a minor inconvenience now, can turn out to be a major repair, if delayed. We are always here to help you save hundreds, if not thousands of dollars.